It's one of the most vivid memories of my high school years. I'm dozing on my kitchen floor, surrounded by a debris of screwdrivers, scrap wood, ball bearings, nails, old cardboard boxes, springs, wood glue, wire hangers, and lots of duct tape. My dad nudges me in the side with his slippered foot. "It's three o'clock in the morning," he says. My cheek is squashed against the cool tile floor. I crack an eye open and see my nemesis: the golf ball that, in just a few hours, I'm supposed to somehow raise six feet in the air, in ten steps, for my physics final project. Goldberg gave credit for "one of the principal props of my career as a cartoonist" to an engineering professor, Freddy Slate. The professor had devised the Barodik to measure the earth's weight with "a series of pipes and tubes and wires and chemical containers and springs and odd pieces of weird equipment which made it look like a dumping ground for outmoded dentists' furnishings," Goldberg wrote. "Like the Barodik, my "Rube Goldberg" inventions are incongruous combinations of unrelated elements which cause a chain reaction that accomplishes something quite useless. It points up the human characteristic of doing things the hard way." If that tickled your fancy, check out the top ten best food-related Rube Goldberg machines and this top ten list. Nothing compares to the fun of building a Rube Goldberg for yourself, but if you just don't feel like digging out the wood glue and the duct tape, an online game called Dynamic Systems will amuse the inventor in you. The task is simple, and doesn't change—get the ball bearing into the cup. But each level adds dominoes, springs, widgets and whirligigs to the challenge. I'm not sure if the game physics is perfectly accurate, but it's a fun way to test out the conservation of energy. A screen shot from Dynamic Systems, a Rube Goldberg video game. Rube Goldberg may have found engineering more amusing than amazing, but his satirical inventions have some truth in them. Rube Goldberg machines powerfully demonstrate how energy is conserved, and can be converted from one form to another, potential to kinetic and back again. I also love how the machines often shift the scale of motion, from a tiny ball bearing falling down a shoot to a huge lever arm swinging. When a photon hits the scintillating material, an electron in one of the atoms gets excited and then drops back down to its ground state, re-emitting a photon in the visible spectrum. This in turn hits the photocathode, causing an electron to fly out into the vacuum chamber of the photomultiplier thanks to the photoelectric effect. Each of the dynodes is set at a slightly higher voltage than the last, causing the electrons to accelerate a little more on their way, increasing their energy. This means that as the electrons hit a dynode, more and more electrons are produced. By the time you get to the end of the chamber, you've got enough electrons for a discernible jump in current, turning the tiny "bump" of the photon into something you can actually detect and quantify. And yet the process has so many steps, you might be tempted to call it Rube Goldberg. You would also have to say that, like the contraption for squeezing a glass of orange juice, it might be complicated, but it definitely works. WASHINGTON -- When Woody Harrelson escapes the living dead in "Zombieland", a new movie opening this Friday, should he head for the hills or the mall? A recently published research paper suggests that he's probably better off hiding in the mall to save his delicious brain. The world is full of things that move in zombie-like fashion, such as particles flowing through a turbulent fluid or the unpredictable price changes of the stock market, so physicists seek insight into this behavior by creating so called "random walking" models. Physicist Davide Cassi at the Università di Parma in Italy looked at how long an entity hiding in a complex structure could survive if being pursued by predatory random walkers. Cassi's paper, recently published in the journal Physical Review E, is the first to describe a general principle of a prey’s likelihood to survive over time while hiding in an irregular structure. Though the paper itself does not specifically refer to fleeing from zombies, it describes "the survival probability of immobile targets annihilated by random walkers." 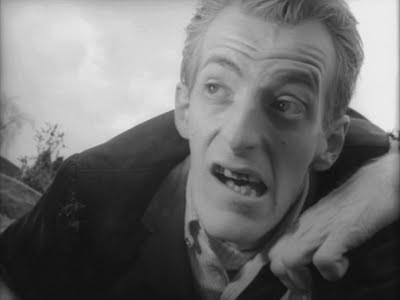 The conclusions suggest that the people trapped in a mall in "Dawn of the Dead" may be better off than the folks stuck in a farmhouse in "Night of the Living Dead." Cassi found that the likelihood of survival when threatened by predatory random walkers is closely related to how complex the prey’s hideout is. The more twists and turns, the safer you'll be. 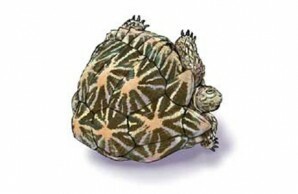 In structures that are highly complex and irregular, the chances of the predator coming into contact with its target shrinks down to almost zero. "There are a lot of applications of these results in a lot of fields of sciences," Cassi said. "The most amazing field of applications of these results are in biology, biochemistry and other organisms." School has started and Halloween is around the corner, which can only mean one thing—it's Nobel season. On Tuesday, October 6, the Nobel committee will be announcing this year's Nobel laureates in physics at a press conference at the Royal Swedish Academy of Sciences in Stockholm. In the hours beforehand, a handful of physicists around the world will be tossing and turning in their beds or frantically checking their cell phone's reception while giving that day's lecture, wondering if they're about to get the "magic call", just minutes before the public announcement, telling them they've won the Nobel prize. The "magic call" has been notorious for catching previous winners unawares, asleep, out shopping, and down at the pub. But the Nobel prize committee is always eerily successful in reaching their target, in a way that's reminiscent of, well, magic. Richard Ernst, for instance, was on a plane from Moscow to New York when the captain came out of the cockpit, walked down the aisle, and informed him that he'd won the 2001 Nobel Prize in chemistry. A rarity was biologist and 2008 Nobel laureate in chemistry Martin Chalfie, who heard the phone ringing in the distance in the middle of the night and turned over for another snooze. But why should Nobel laureates be so in the dark about their nomination? The Nobel committee invites a select group of scientists all over the world to submit nominees, chooses a short list, and gets the opinion of experts in the relevant topics before deliberating. Doesn't the committee give any hint of whom they're considering? The answer is a resounding, official "no." While I suspect the list leaks out at least to some extent, not only is everyone involved forbidden from breathing a word about the nominees, that restriction holds for a half century! Citation Laureates have been cited so often in the last two or more decades that these scientists typically rank in the top 0.1% in their research areas. Not only do Citation Laureates have stratospheric citation totals, they also typically write multiple high-impact reports, and do so over many years. How good are the predictions? Since they started announcing their tips in 1989, Thomson Reuters have only completely missed the mark on two occasions. Other than that, they seem to correctly predict at least one of the prizes—but keep in mind that they choose several possibilities for each category. Whether that's terribly successful statistically, I leave to the Enrico Fermis of the world. But research suggests that citations are losing their influence on determining the Nobel prize as author lists grow and fields become more diverse. A paper on the arXiv early this year looked at whether Google's PageRank algorithm, which bases a page's rank on the number of pages that link to it, could correctly spin a pile of citations into a Nobel. 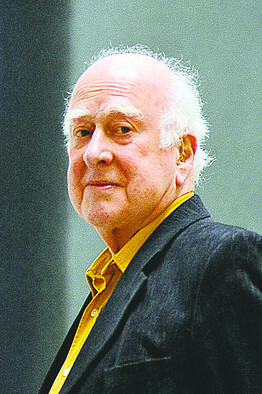 Peter Higgs: not-so-hotly-tipped for the Nobel. Whether you've got an algorithm or just a hunch, it's fun trying to guess who the committee will choose. ScienceBlogger Chad Orzel has started a betting pool for this year's prizes. If you're low on ideas, check out the hotly-tipped physics contenders according to Thomson Reuters, which includes decorated quantum physicist Yakir Ahoronov and metamaterials pioneer Sir John Pendry. Surprisingly or not, the list doesn't include Peter Higgs, who made the Wall Street Journal's short list—multi-billion dollar accelerators are not as weighty as citations, apparently. A child-prodigy medical researcher who loves to run. An engineer who practices back-flips in his spare time. 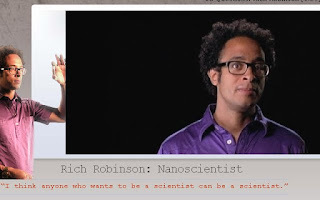 A nanoscientist who takes soul-searching photographs. These are a few of the scientists profiled so far on the new NOVA Web series, "The Secret Life of Scientists." NOVA explores the different facets of each scientist's life, including their passions, their research, their experiences, and their opinions. The videos are short and minimalistic, and there are no hosts or voice-overs, keeping the viewer's attention on what the individual has to say. Every two weeks, the Secret Life team puts a new scientist under the microscope. When a scientist is profiled, viewers have a chance to submit questions and, after a couple of weeks, get some honest answers. The team's just getting started, but they already have a couple of great videos in the can. The idea behind it reminds me vaguely of a certain US Weekly column. I can see it now - Scientists! They're just like us! Brian Greene shops at Target! Steven Hawking enjoys ice cream and the occasional bad science fiction movie! It also has echoes of the Washington Post's awesome Web video series, onBeing. At any rate, it's refreshing to see science media that focuses on people. It's so easy to forget that a new telescope, medicine, and or technology doesn't just get churned out by some alien science machine, but comes into being through days and months and years of people living out their lives. Which are just like the lives of the rest of us...with a bit more test tubes, or balled-up pieces of paper, or blinking lights, perhaps. Physicist Josh Silver's specs may look retro, but they can change lives. Back in July, I wrote about the 2009 TED Global Conference, held at Oxford. The Global Conference is a sort of carnival of ideas, with talks and presentations by by great thinkers of every stripe, from storytellers to designers, anthropologists to physicists, and videos of this years talks have started to trickle onto TED's online archive. Physicists, of course, were well-represented among the ranks of TED speakers, but when Oxford prof Joshua Silver took the stage, the audiences weren't in for the usual science lecture. Silver is an atomic physicist, but lately he's been obsessed with optics; not because he wants to design an invisibility cloak or improve high-speed communication, but because he wants to address a very important problem for the world: bad vision. As Silver points out in his talk, glasses, contact lenses, and even laser eye surgery are facts of life for about half the people in the developed world. You can imagine that the same should be true for people in the developing world. But while there is equal need for vision correction among people, say, in Sub-Saharan Africa, there is a serious dearth of optometrists, about one to every eight million people. In the UK, by contrast, the ratio of optometrists to people is about 1 to 10,000. Believe it or not, this is a problem for physicists to solve. Or, at least, that's the way Joshua Silver saw it. Glasses and lenses are fairly cheap and plentiful; optometrists are not. The answer: a pair of glasses that a patient could adjust on her own to fit her needs. At a basic level, correcting bad vision boils down to high school optics. In the eye, muscles squeeze or release a small lens at the front of the eye, that focuses an image on the retina, the brain's outboard receiver for visual information. Squeezing the lens makes it fatter, which focuses nearby objects; relaxing the lens flattens it, focusing far away objects. But if the geometry of the eye is slightly off—if the lens is deformed, or the retina too far away from the lens—the lens's focal point will hit just in front of the retina (nearsightedness) or behind the retina (farsightedness.) Glasses are additional lenses, shaped to bend the light in a way that compensates for a refracting system that doesn't work. Usually these lenses are made from plastic and are shaped according to the patients' needs. Once made, they can't be adjusted. So Silver came up with an ingenious alternative to prescription glasses. He invented a pair of glasses that had a space encased by two flexible plastic walls in place of each lens. By pumping in or removing liquid from the space between the walls, the patient can put the glasses on and change the shape of the lens until he can see clearly. 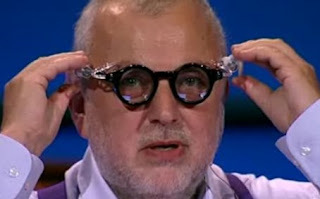 The glasses cost only about $19—though Silver wants to drive the price even further down, since many of his prospective patients live on a dollar a day— and the whole adjustment procedure takes less than ten seconds, as Silver demonstrates in the talk below, shot at the TED Global Conference. Not only that, Silver set up the Centre for Vision in the Developing World to study and remedy the problem of access to vision correction and cook up other new ways of making adjustable lenses. Now that's physics in action. 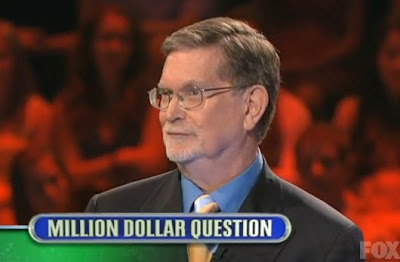 George Smoot on last Friday's "Are You Smarter than a 5th Grader?" 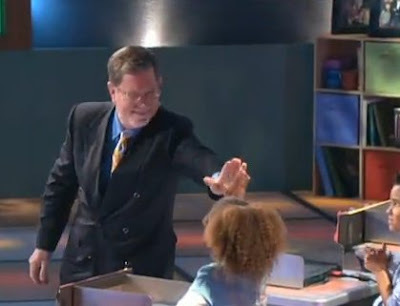 George Smoot, a UC Berkeley professor who won the 2006 Nobel prize in physics, stepped up to the challenge last Friday as a contestant on "Are You Smarter than a 5th Grader," the entertainingly humiliating game show that tests adults on facts a ten-year-old is expected to know. The show entertains by painfully exposing just how little of their elementary school education adults retain, so having a Nobel laureate on stage called for even more ridiculous FOX theatrics than usual. In the opening sequence, the announcer booms, "Will he blow it, and be the laughing-stock of Nobel prize-winners everywhere?" I wonder if any of Smoot's Berkeley colleagues started to sweat at that point. Would the show expose the shortcomings of science? Would Smoot remember how to spell the word "Mississippi?" Unfortunately for host Jeff Foxworthy's humor routine, which is usually based on insulting his guests, Smoot sailed through questions on the angles of an equilateral triangle and whether the conga was a percussion instrument. The show's writers tried to inject some tension with a fifth-grade astronomy query: "What country was the first to put a human being in space?" Smoot quickly remembered the Soviet cosmonaut Yuri Gagarin, but Foxworthy stumped him on the year—1961. That proved to be the Foxworthy's only opportunity to poke fun at the Nobel laureate. Part of game play is cribbing answers from the show's stable of adorable, TV-ready ten-year-olds. So the fifth graders began to look decidedly pouty as Smoot answered question after question unaided. Finally, apparently realizing that he was taking all the fun out of the show, Smoot decided to "cheat" by blindly "copying" the on-stage ten-year-old's answer to the $500,000 question. This is by far the riskiest move a contestant can make, and Smoot clearly knew the answer to the question. Luckily, he wasn't punished for his good sportsmanship; ten-year-old Francesca answered the question correctly, and Smoot went on to be the show's second-ever million-dollar winner by correctly answering the question "What US state is home to Acadia National Park"—it's Maine. Smoot flirted with the small screen earlier this year with a cameo on nerdtastic sitcom "The Big Bang Theory." Not only was it nice to see someone actually win "5th Grader" for a change—other episodes end on a rather more embarrassing note—but it was wonderful for an important modern physicist to enter the American consciousness and crack a few redneck jokes about himself while he was at it. The audience oohed and aahed when he pulled out his Nobel medal, and Smoot even got to say a word about his research. FOXWORTHY: "So, how does a guy go about proving the Big Bang theory?" SMOOT: "We figured out over the years a way to make a picture of the embryo universe." SMOOT: "So it's the very beginning of the universe, but it's got the blueprint for what's gonna happen later." Foxworthy then cut in, joking, "You found the infant uni...I can't even find my keys half the time!" Thanks, Jeff. Still, one of the most exciting advances in cosmology made it onto primetime television, even for just a few seconds. And well done explaining it, Dr. Smoot. What Smoot described as finding "the embryo universe" provided crucial evidence for the big bang, transformed cosmology from a theoretical to a decidedly experimental science, and earned him half the Nobel. In 1989, Smoot and colleague John Mather (he's got the other half) launched the Cosmic Microwave Background Explorer satellite, which goes by the cute name COBE, to take detailed measurements of the cosmic microwave background. 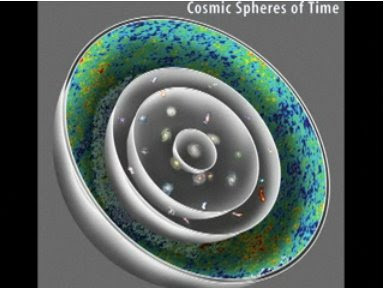 "We have a tool that actually helps us out in this study, and that's the fact that the universe is so incredibly big that it's a time machine, in a certain sense," Smoot explained in a talk he gave at a design conference last November. Because the universe is so vast and light has a 300 million meter per second speed limit, it can take equally vast amounts of time for light from other galaxies. Light is a snapshot of a place as it looked when the light left it, whether that be eight minutes ago or millions of years ago. The cosmic microwave background, or CMB, is the oldest light in the universe, an approximately 2.7 Kelvin bath of microwaves coming to us from just 380,000 years after the Big Bang. It is a snapshot of the universe in its infancy, "when the universe was hot and dense and very different," as Smoot says, and the farthest back our time machine can take us. 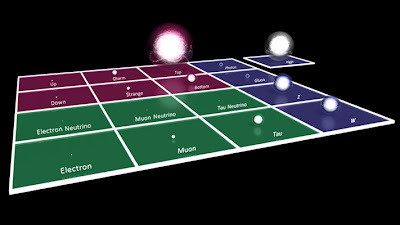 The picture below, from one of Smoot's slides, shows a series of nested spheres with the Milky Way in the center. The outer boundary of what we can see, that strange Jackson Pollock of rainbow speckles, is the CMB. "You see the whole big picture?" Smoot asked his audience. "The beginning of time is funny—it's on the outside, right?" The speckles on the CMB map are really the tiniest of wrinkles, differences of one part in 100,000. The CMB was first detected in 1965 when a pair of scientists couldn't get rid of some noise in a radio receiver. It matched the Bing Bang theory; when the hot, dense universe expanded, it cooled, filling the universe with remnant heat—the CMB. But for years after that, scientists thought the CMB was completely uniform. It turned out that the CMB was more like an abstract painting that's just one color. You have to look very closely to see the bumps and texture of the paint brush, and that's just what Smoot and Mather did with COBE. From these tiny wrinkles, Smoot explained, "we're going to go..to these irregular galaxies and first stars to these more advanced galaxies, and eventually the solar system, and so forth." So "embryo" is precisely the right word—the hot dense universe folds in itself the irregularities that grew up into the grand structures of stars and galaxies as we know them today." The wrinkles allowed Smoot and Mather to measure the intensity of the different wavelengths within the CMB. Mapping intensity versus wavelength, the researchers created a curve that matched exactly the predictions of the Big Bang theory—another experimental pillar supporting the theory. 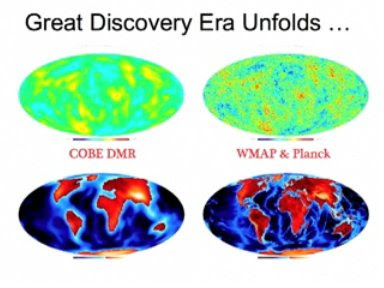 Since COBE, experimental cosmology has grown into an exciting field of its own, with projects ranging from balloons at the edge of space to the the South Pole Telescope to the Planck space telescope, the successor to COBE and later CMB observer WMAP. You can see the improved resolution from COBE to WMAP in the following picture; the images of the world are for comparison to show the kinds of details that COBE smooths out. Planck, orbiting around Lagrange point 2 has just seen first light and will map the early universe in greater detail than either COBE or WMAP. This would have been too long a story for primetime television, but I'm still happy that Smoot managed to shoehorn a sense of science and wonder into the episode. However, I'm still left wondering why George Smoot, who donated his Nobel prize money to establish fellowships, needs a million bucks. WASHINGTON — Biomedical research could someday look a lot like playing video games thanks to a new device that allows users to manipulate cells with the swerve of a joystick. Researchers manipulate a magnetically-tagged t-cell along a magnetic wire via a joystick. Credit: Sooryakumar Group. The team at OSU put the device through its paces with magnetically-tagged T-cells, the body's guardians against infection. They snapped the cells to attention at one end of the chip, marched them down to the other end, and made them hop from one wire to another, reaching speeds of about 20 micron, or about a one-fifth the width of a human hair, per second. "Part of the problem with cancer ... is that it's our own cells going haywire, so it's a heck of a lot harder to figure out what's different," Chalmers said. With this method, he said, researchers could magnetically tag the well-understood healthy cells and then remove them from a sample, leaving only the cancerous cells. Chalmers said this would be a boon to both a researcher studying a specific type of cancer or a clinician diagnosing a patient. "The technology to do high-level analysis is pretty amazing, but it's only as good as the purity of the sample you start with," Chalmers said. "The more you can separate them out, [the more] you know what you're looking at." The small magnetic fields are gentle on specimens; the device works on a flat surface, an improvement over other methods; and it's also cost-effective. The project's principal investigator, physics professor Ratnasingham Sooryakumar, said that the whole set up only costs about $200. He said it could easily be scaled up to a square centimeter silicon platform, with about 10,000 tiny traps, or scaled down to manipulate organelles within a single cell. T-cells race along the magnetic wires, steered by joystick. Credit: Sooryakumar Group. Sooryakumar said that scaling up would lead to a "lab on a chip," where researchers could cheaply and easily look at distinctive behavior within large populations of cells, making it easier to draw firm conclusions. "You can look at each cell rather than averaging it out, and say, 'the cell on vertex number 348 did this,'" Sooryakumar said. "When you actually have 10,000 of them to analyze the data, you can understand stat distributions that we normally would not have gotten in ensemble measurements, and that's a huge thing." Sooryakumar envisions embedding the device into containers that hold tiny amounts of fluid, like blood. By tagging a certain kind of particle, researchers could begin separating, say, viruses from healthy blood cells. Chalmers added it could be used to study cancer in blood samples. "One in a million or one in a billion cells in your blood could be cancer," Chalmers said, but the technique could achieve higher concentrations of cancer cells to study by tagging and removing healthy blood cells. Prem Thapa, a researcher at Kansas State University in Manhattan, Kan., who was not involved in the study, called the approach "interesting and innovative," adding that the technique had advantages over existing optical manipulation methods. "The significance of these studies is high," Thapa said. But he pointed out that electrically excitable neurons or muscle cells may not take so kindly to magnetic manipulation. Thapa's K-State colleague, physicist Brett Flanders, was impressed by the results but called the demonstration "simple." "As with ... all potential biophysical applications, there's a lot more work to do," Flanders said. "I'm looking forward to seeing what comes next." There's a classic elementary school experiment that gives you the inkling that fluids have more to them than meets the eye. You're handed a penny, a glass of water, and an eyedropper. Your task: fit as many drops of water as you can onto that penny. As the droplet grows, the experiment acquires the dramatic tension of a game of Jenga. Will this drop burst the droplet? Will the next? 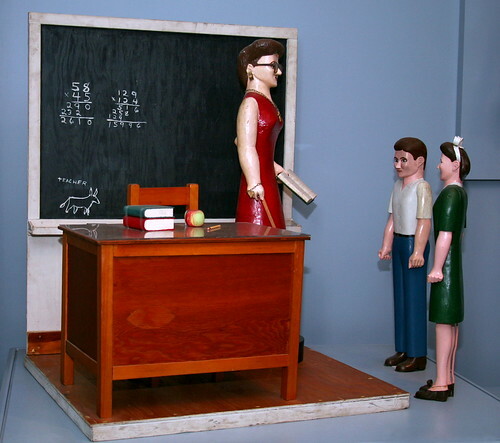 The task delights and fascinates schoolchildren. Some of those schoolchildren grow up into physicists, and a good fraction of physicists, for whom the delights of the penny experiment perhaps never fade, devote their entire careers to probing the weird, often counterintuitive behavior of fluids. The mysterious Kaye effect was first seen in the 1960s, and has fascinated scientists ever since. As the video describes, the falling shampoo piles up until a dimple is formed. Then the jet continues to pull air with it down into the dimple, eventually gliding on this air pocket and ramping out again into the air. You can see the effect with oil too. 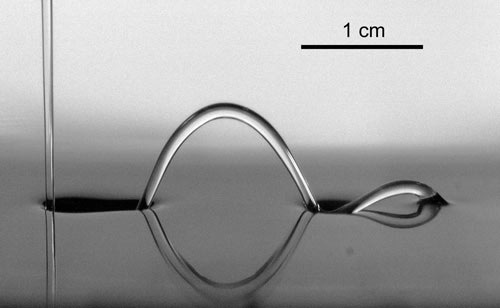 The University of Twente's "Gallery of Fluid Motion" features videos that have won awards at the past meetings of the American Physical Society's Division of Fluid Dynamics. The videos show us strange phenomena, and the unexpected reasons behind them. For instance, one video on snapping shrimp reveals that the shrimp's claw doesn't directly stun its prey. Instead, a very different mechanism is at work. WASHINGTON — For the first time, physicists have photographed the structure of an atom down to its electrons. While tools like the scanning tunneling microscope already map the structure of electrons in a sample of many atoms, "it's always good to have complimentary approaches," Goldhaber-Gordon said. "Sometimes something puzzling in one view becomes crystal clear in the other view. Each one gets you a step closer to a full understanding." Wow, so our chemistry teachers weren't lying to us! I remember peering at the little diagrams of fat blobs impaled on the x, y, and z axes, and thinking, "Yeah, right." Sure, you can solve Schrodinger's equation for a hydrogen atom and "see" for yourself, but quantum mechanics is maddeningly hard to wrap your mind around. And for those of us who can't see the answer in a math function, it's so wonderful to be able to look at a photo. The spherical 2s orbital chopped in half (left), and the 2p orbital (right). Meanwhile, Erwin Muller invented the field-emission electron microscope in 1936. It works on a simple principle: get a strong, localized electric field between a sharpened sample and a screen coated with a fluorescent material, and the electric field will rip electrons off the sample (emission) and send them flying into your screen. Its successor, the field-ion microscope, pulled off whole ions, allowing Muller to see the (albeit blurrily) the atoms in the tip of a tungsten needle. This retro tech is the key, in my opinion, to why this research is so exciting for the general public. Physicists and materials sciences have developed dozens of imaging techniques over the years. They can probe oxidation states and atomic structure with x-rays, and can make gorgeous maps of materials using scanning tunneling microscopy. The STM especially is a really incredible invention, and allows us to explore the nanoscale world and witness phenomena that are the direct consequence of quantum mechanics. But, as Goldhaber-Gordon says, there's something visceral about these FEEM images. Let's go back to the STM for a second. The STM scans a needle-like tip across a sample surface and measures how many electrons tunnel (a quantum-mechanical phenomenon) between the surface and the scope's needle-like tip in order. Because the tunneling current decreases exponentially as a function of distance between material and scanning tip, the current can be used to adjust the microscope continuously to keep it at the same distance away from the sample it's scanning. These values are what form the resulting, often breathtaking, image. Meanwhile, the FEEM image works on the same basic principle as a film camera, except one is a case of photons impinging a piece of film and the other has electrons splatting on a fluorescent screen. What comes out, a physical mark of the quantum world, is somehow more believable to a member of the general public (myself included) than any other explanation. There's nothing like a Hubble photograph to drive home how rich and vast the universe is; similarly, these images make the baffling laws governing the incomprehensibly small simply more believable. People often say that standing outside on a clear, starry night gives you a sense of scale, of how tiny you are compared to the vastness of the universe. But it's tough to really comprehend just how vanishingly miniscule we are. We're so used to living in inches and feet and miles—or centimeters, meters, and kilometers—that it's nigh impossible to wrap our minds around the enormous distances between us and other objects in the universe, even ones we can see, like the sun and moon. Is there any way to comprehend it? That may be a tall order, but folks at Agnes Scott College in Atlanta, Georgia have come up with a wonderful, creative approach in a project called MASS. MASS stands for Metro Atlanta Solar System, a model of the solar system scaled down by a factor of 150 million to fit within Atlanta's city limits. Agnes Scott's gorgeous Bradley Observatory is the center, specifically the circular stone courtyard in front of it. The courtyard's diameter is about 30 feet, providing the scale for the planets, the rest of which are located at landmarks around the city that are the right distance away. Earth is a little more than half a mile away from the sun, at Decatur Public library, while Neptune is 18.5 miles away at Sweetwater Creek State Park. John Norton at the University of Pittsburgh frames the atom's tininess by offering you what seems at first like a sweet deal: an atom of gold for every second since the dawn of the universe. Go inside the atom, and scale becomes even more astonishing. While a hydrogen atom is about an angstrom across, the proton at its center is five orders of magnitude smaller. If the proton is now a basketball, the atom is 15 miles across. The rest? Empty space. As for the electron, good luck pinning it down to measure how wide across it is. What we do know is that it's about 2000 times less massive than the proton. Here's a fun and kind of bone-chilling representation of just how much nothing there is inside the atom. It may have a boring name, the nebula known as NGC 630 is a minor celebrity these days. This butterfly-shaped cloud of gas, pluming spectacularly from a distant dying star, is all over the Web right now. It's one of the first images snapped by the Hubble Space Telescope since STS-125 astronauts replaced its camera and upgraded its instruments in May. At 19 years old, Hubble may have seemed a bit young for a facelift. But, as any PC or camera owner knows, a lot has happened in the world of electronic and optics in the last 19 years. Judging from these first images, the Wide Field Camera Three is doing a fantastic job. Although it shares the same ultraviolet through infrared range as the Wide Field and Planetary Camera 2, its field of view and resolution outshine that of the retired Whiff Pick Two. As the Christian Science Monitor points out, there's a marked difference in the new photos, which boast a crisper image and exquisite detail. And there should be: the makeover cost NASA nearly a billion dollars. But it's giving the aging telescope a new lease on life; NASA estimates that Hubble's instruments, assuming no major disasters, will funnel in rich data from the great beyond for another four to five years. When its instruments fail, the scope will be de-orbited, which is a euphemism for burning up in the atmosphere, and replaced by the next generation James Webb Space Telescope. Before and after image of the Omega Centauri star cluster, 16,000 light-years away. These photos are gorgeous, but that's not only thanks to Hubble. The WFC3 sees electromagnetic radiation in ultraviolet through infrared, which is wider than thethe narrow slice of the spectrum human eyes perceive. So data that falls outside the visible is assigned a representative color so humans can see the details. That's the case in the photo below of Saturn, shot in infrared (before the revamp). An infrared shot of Saturn. Another technique is to assign colors to the very specific wavelengths emitted by different chemical elements. For the famous photo of the Eagle Nebula below, image processors assigned the red, green, and blue to emissions of ionized sulfur, doubly-ionized oxygen, and hydrogen atoms. The Eagle Nebula painted in chemical elements. I remember feeling cheated when I first learned that Hubble's colors weren't "real," but now that seems like a closed-minded reaction. Human perception is extremely limited, and placing this data within grasp of our limited eyesight is simply the best way to convey the complexity and structure of these objects. For an in-depth explanation of how Hubble images are processed, check out this article from Slate. A screenshot from Phil Owen's winning video "Origin of Mass"
Phil Owen might just be the envy of every geek on earth. 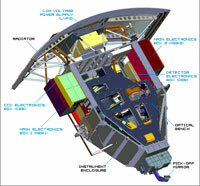 In November, the twenty-five-year-old will be flying from Australia to Geneva, Switzerland, courtesy of CERN. There he'll have a front-row seat to possibly the most anticipated event in scientific history—the startup of the Large Hadron Collider. And that's just the beginning. 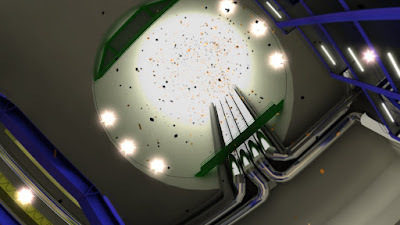 As the winner of a video contest held by the collaboration that works on ATLAS, the LHC's flagship detector, Owen will be the project's multimedia intern, with the opportunity to document those first moments in gorgeous 3D. "I had some other plans for next year, but I think I'll put them off," he says. "It's an amazing opportunity." Owen, who was born in the US, is finishing up his bachelor's degree in information technology at Monash University in Australia. While studying he's been working on medical visualization projects with the university's pharmacy faculty. "In the future I want to branch out and do material for all fields of science," he says. Phil Owen's rendering of the Standard Model. In his winning video, "Origin of Mass," Owen explains the significance of the Higgs boson with voiceover and shimmering 3D images. Entering the contest, he says, was a lot like cramming for a very tough exam. "I spent a couple of weeks studying really hard, learning the particle physics, making sure I understood it myself before diving into it," he says. As the ATLAS multimedia intern, Owen will be creating animations based on the very first collisions. "It's daunting," he says, but adds that he thinks visualization provides a much-needed dimension to communicating science. "I think it's to put things in the context for people," he says, "You can tell people how big the sun is a thousand times, but they don't get it till you can show them an actual image comparing it to earth." 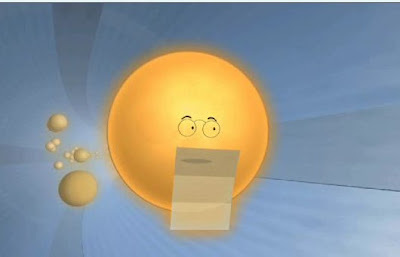 A screenshot from Richard Green's video, "Proton." 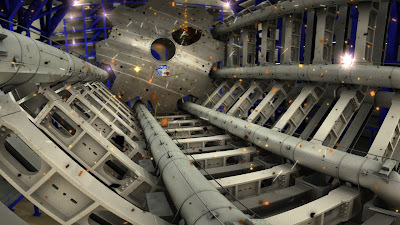 Forty-seven-year old Richard Green, a video game environment designer in Seattle, won the "Neutrino Prize" for fourth place with his charming video of a talking proton on its way to a collision. "I just sort of tried to grab something a little off-kilter about [the LHC]," Green says. Since the LHC collides protons, he started to imagine the proton as a character. The resulting video, he says, "is the life of a proton. I thought he should just be a talking head, telling the story himself, like it's him going to work." Hence the inspiration for the proton's "working class" voice. A screenshot from Simon Howells' video, "Atlas"
In third place with the "Electron Prize" was twenty-five-year-old Brit Simon Howells, a master's student in 3D animation at the University of Hertfordshire. His video "ATLAS" is an atmospheric tour of the behemoth detector, set almost entirely to music. "When you're trying to get the public interested in science, I don't think ramming the technicalities down their throats is the way to go," he says. In one scene, a snow of electronics falls gently through ATLAS empty innards. "I wanted to show the epicness of the scale, not just in the size, but in the hundred million components that go into making ATLAS, the vast numbers of densely packed components," he says. "I see it as my generation's space race, which was quite a simple thing to convey, get us to the moon and back, whereas the LHC is a bit more difficult to explain," he says. "I wanted to make a bit more of an artistic thing, get people more interested in the visuals." You might have read it in Nature News, Starts with a Bang, or Science: physicists have discovered magnetic monopoles. Sort of. Positive and negative charges are happily independent, but north and south poles always come in twos. As the textbook example goes, cut a bar magnet in half, and you'll get two smaller bar magnets—you can never isolate one from another. Monopoles—a lone north or south pole—simply don't exist. Or so I was told when I first heard about monopoles, in my first college course on electromagnetism. I heard about them for the second time from Shou-Cheng Zhang, a condensed-matter physicist who studies exotic phases of matter. He seemed to have a rather different opinion. As my hand struggled to keep up with the interview, it occurred to me that Stanford clearly thought very highly of Zhang; sunlight flooded through a large window into the generously proportioned office, which was located just next door to one of the department's Nobel laureates. Profiling Zhang was my first real assignment as an intern at SLAC National Accelerator Laboratory, and I couldn't have wished for a better subject. Well-spoken and patient, Zhang made his research both fascinating and accessible. He works on the quantum spin Hall effect, a strange state of matter where the spin of an electron is determined by its direction of motion. Zhang likened it to a graceful dance from the days of Jane Austen; couples moving counterclockwise around a room also spin counterclockwise, and vice-versa with couples moving clockwise. If this happened in a real material, he said, the current could flow without causing the material to heat up. Shock enough for anyone who's heard how Moore's Law, which says that processing speed doubles every 18 months, may be reaching its limit as the ever-tinier transistors get hotter. But then Zhang said something even more astonishing. This kind of material, he said, would give rise to a magnetic monopole. I remember being dumbfounded. Surely I didn't hear the word monopole come out of his mouth. Quadrupole, maybe? The look on my face must have given me away, because Zhang just grinned. Magnetic monopoles have always been a curiosity for physicists, and many of us think that they ought to exist. In the 1970s, there were searches going on for them, and the most famous one was led by a physicist named Blas Cabrera. He took a long wire and made eight loops out of it, designed to measure magnetic flux through it. If a monopole passed through it, he would get a signal of exactly eight magnetons. But if a standard dipole magnet passed through it, he'd get a signal of +8 followed immediately by one of -8, so he could tell these apart. And, as of today, no one has seen good evidence for a second magnetic monopole, leading us to believe that the first one was spurious. To understand how a material can act like a magnetic monopole, it helps to examine first how an ordinary metal acts when a charge—an electron, say—is brought close to the surface. Because like charges repel, the electrons at the surface retreat to the interior, leaving the previously neutral surface positively charged. The resulting electric field looks exactly like that of a particle with positive charge the same distance below the surface—it’s the positive mirror image of the electron. In fact, from an observer’s point of view, it’s impossible to tell the difference. The concept of an image charge is something undergraduate physics students encounter in their very first electricity and magnetism class, along with the idea that the magnetic monopole doesn’t exist. But Zhang’s "mirror" alloy is no ordinary material. It’s what’s called a topological insulator, a strange breed of solid Zhang specializes in, in which "the laws of electrodynamics are dramatically altered," he says. In fact, if an electron was brought close to the surface of a topological insulator, Zhang’s paper demonstrates, something truly eerie would happen. Instead of an ordinary positive charge, Zhang says, "You would get what looks like a magnetic monopole in the 'mirror.'" The magnetic ions sit at the tips of four-sided pyramids or tetrahedra connected corner to corner (see diagram). At temperatures near absolute zero, they should organize themselves by a simple rule: In each tetrahedron, two ions point their north poles inward toward the center and two point outward. Flaws in this pattern are the monopoles. If one ion flips--perhaps because it gets energized by the thermal energy in the crystal—it leaves one tetrahedron with three ions pointing inward and the neighboring tetrahedron with only one ion pointing inward (see figure). The two imbalanced tetrahedra act like north and south magnetic poles, respectively. If nearby spins also flip, the imbalances can shift independently from one tetrahedron to the next, so that the north and south poles end up connected only by a string of ions that point from one to the other. Thus the imbalanced tetrahedra become magnetic monopoles. Like any charged particle, opposites attract, and the north and south poles typically cluster together less than a nanometre from each other. That makes them extremely hard to detect individually. So the evidence isn't clear as day whether this is really a magnetic monopole. But my question is whether spin ice could be at least used to study the creatures by analogy, because they're of great interest. Monopoles would be the magnetic equivalent of electrically charged particles, and there are several reasons physicists would like to see them. In 1931, famed British theorist Paul Dirac argued that the existence of monopoles would explain the quantization of electric charge: the fact that every electron has exactly the same charge and exactly the opposite charge of every proton. In the 1980s, theorists found that the existence of monopoles is a basic prediction of "grand unified theories," which assume that three forces—the electromagnetic, the strong force that binds the nucleus, and the weak force that causes a type of radioactive decay—are all different aspects of a single force. Monopoles are a part of the high-energy physics menagerie of exotic, never-before-seen particles. A few of their zoo-mates include anyons, 2-dimensional particles that straddle the properties of fermions and bosons, and axions, feebly interacting particles that "clear up" problems with charge-parity violation in quantum chromodynamics like Axion detergent cleans dishes (hence the name. Thanks Frank Wilczek). 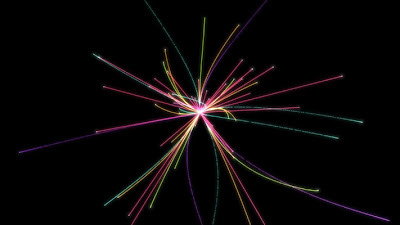 Then there's the most famous hypothetical particle of them all, the Higgs boson. These entities are lynchpins in our best descriptions of the universe. But so far there's no sign of them—at least in cosmic ray showers or the short-lived spaghetti of particles in a collider's detector. Meanwhile, it seems like you can't swing an atomic-force microscope in a condensed-matter system without hitting one of these things. Let's go back to Shou-Cheng Zhang. A particle physicist by training, Zhang had a very philosophical view of the relationship between condensed matter physics and high-energy physics. Using the words of English poet William Blake, he said that studying condensed matter physics was like "seeing a world in a grain of sand." "It means that the structure of subatomic particles is reflected in the systems they make up—the solid, the grain of sand," he told me. Or you could think of it as an Escher waterfall: just when you think you've gotten to the top of the waterfall with whole systems of particles, you find yourself at the bottom, with the fundamentals. Spin-ice and topological insulators are hardly the only materials where high-energy physics might find their elusive particles. Take graphene, for instance. A single-atom-thick layer of graphite, the same stuff that's in your pencil, the stuff's been hailed for the last five years or so as the new wonder material for electronics because electrons zip effortlessly through it. But the same physics that makes it so promising for lucrative applications also make it a playground for high-energy pursuits. One reason is that electrons in graphene don't act like regular old electrons. They act sort of like photons with charge and spin 1/2. There's an excellent article by Robert Service in the May 15 issue Science on the subject that's unfortunately only available to subscribers, but I'll quote some of it here. In the lattice of a typical metal, electrons feel the push and pull of surrounding charges as they move. As a result, moving electrons behave as if they have a different mass from their less mobile partners. When electrons move through graphene, however, they act as if their mass is zero—behavior that makes them look more like neutrinos streaking through space near the speed of light. At such "relativistic" speeds, particles don't follow the usual rules of quantum mechanics. Instead, physicists must invoke the mathematical language of quantum electrodynamics, which combines quantum mechanics with Albert Einstein’s relativity theory. Even though electrons course through graphene at only 1/300 the speed of neutrinos, physicists realized several years ago that the novel material might provide a test bed for studying relativistic physics in the lab. Klein realized that when electrons travel at relativistic speeds, the likelihood that they will tunnel through a barrier can skyrocket. That’s because in the spooky world of quantum mechanics, within which particles can wink in and out of existence, a relativistic particle that hits a barrier can generate its own antiparticle, in this case a positron. The electron and positron can then pair up and travel through the barrier as if it weren’t even there. In March of this year, Columbia physicist Philip Kim reported observations of the tunneling in a real-world material—good old graphene. So whether or not spin-ice monopoles are just as good as the kind Blas Cabrera hoped would fall from the sky, they're worth creating and studying. Condensed matter physics holds out an immediate and fairly inexpensive way to test out the predictions of Grand Unified Theories. While I'm not expecting anyone to find the Higgs boson in a sheet of graphene, maybe high-energy physicists will make worthwhile discoveries by looking in the grain of sand, instead of the galaxies, for signs of their universe.